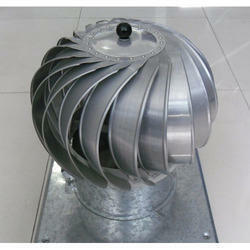 Turbo Ventilator are propeller type and are used for general ventilation. Turbo Ventilator Fans are used to remove the heated air and fumes from ovens, workroom, kitchen etc and are also used for ventilating commercial buildings. Mutiara Roofing Industries Pvt. Ltd.
We are a leading Manufacturer & Supplier of Air Ventilator such as Turbo Air Ventilator, Turbine Air Ventilator Installation , Rooftop Turbine Air Ventilator, Powder Coated Air Ventilator and Turbine Air Ventilator from India. 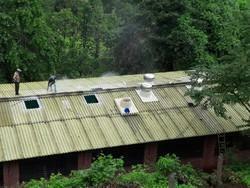 We are offering a large assortment of Turbine Air Ventilator Installation Service to our valuable customers. After rendering, our quality team experts check these installation services to ful fill the requirements of clients. Being a noticeable firm of market, we are rendering Corporate Turbine Air Ventilator Installation Service. We installed wind turbines for various wind turbine manufacturer. Indo Star Insulation Pvt. Ltd. In order to meet the diversified fabrications needs of several industries, we are instrumental in providing well managed Basement Mechanical Ventilation System Installation Service. This installation service is rendered under the directions of our skilful professionals who only use the latest tools and modernize techniques. We can supply and install our wind driven turbo air ventilators at most reasonable rates in chandigarh, punjab, haryana and himachal. - suitable for industrial sheds. Our company has been successful in winning appreciation from the clients as one of the most prominent names in the trading of 325KW Turbine Installation Service. Backed by highly accomplished personnel in this arena, we are offering Home Wind Turbine Installation Service. A team of dexterous personnel works in close coordination with our patrons to impart these services as per their needs. Provided services are largely valued amid our patrons for their on-time execution.